is a Psychoanalyst in Private Practice and has been providing Psycho-dynamic Psychotherapy and Art Therapy for mental health issues, trauma and addictions since 1987 and Psychoanalysis since qualifying in 2008. 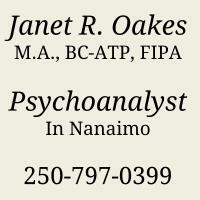 Janet received her Psychoanalytic training at the Vancouver Institute of Psychoanalysis. She is a fellow of the International Psychoanalytic Association and the Canadian Psychoanalytic Society. Janet has served on the executive of the Western Branch of the Psychoanalytic Society and on the Extension Committee planning courses and teaching Psychoanalytic theory and technique. She has also served on the National Scientific Committee of the Canadian Psychoanalytic Society. Janet has an ongoing interest in applied psychoanalysis relating to Social Conditions, Literature, Arts and Culture. Janet's patients usually seek treatment because they are depressed or anxious. Many are experiencing difficulties in their relationships or with their work. They may be going through life transitions, stress, loss or grief. Some have experienced trauma or abuse, eating disorders or addiction. Often treatment helps patients overcome blocks to their creativity and enhances their self esteem and enjoyment. Janet Oakes uses a psychoanalytic approach in her clinical work with individuals who want to engage in talk therapy to try to understand the meaning of their problems as they go about making changes in their behaviour. People she treats see her for one to four sessions weekly. Janet Oakes also provides clinical supervision and consultation to clinicians interested in a psychodynamic approach.